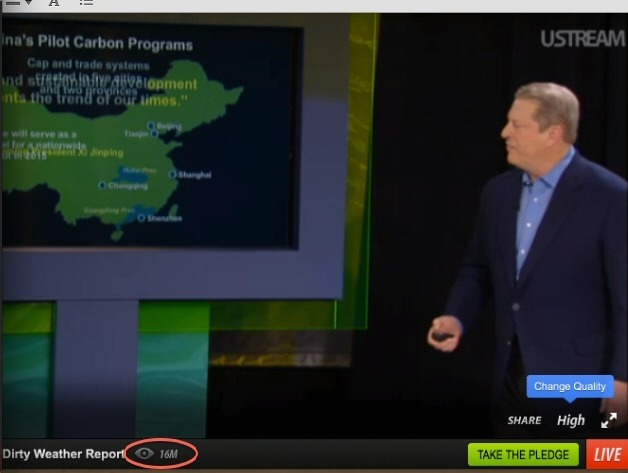 Al Gore's USTREAM viewership is as inflated as his 'science' | Watts Up With That? Last week on November 14th and 15th, former vice president Al Gore’s Climate Reality Project let loose with another “24 hours of Climate Reality” in a global TV webcast hosted on USTREAM. The emphasis this year was in trying to make connections between energy use and weather events with the theme being “dirty energy=dirty weather”. While there’s probably a dirty joke in there somewhere, Gore as usual took anecdotal events such as hurricane Sandy and tried to connect weather and climate with leaps of scientific certitude such as “In fact, all weather events are now effected by global warming pollution.” in a recent Guardian interview. Just a few years ago, attempts to connect weather and climate were laughed at by the global warming crowd and they used the oft repeated maxim “weather is not climate”. Despite that drawing of scientific line in the sand almost two months before his broadcast, Mr. Gore and his activists didn’t blink an eye at making hurricane Sandy the most recent poster child for climate change, much like Mr. Gore did for hurricane Katrina. During his “dirty weather” broadcast, Mr. Gore and his team of activists repeatedly tried to convince viewers that energy use is directly tied to weather events such as hurricane Sandy. The logic used is that warmer temperatures produce more frequent and more intense hurricanes. The reality is that the United States has been in a “hurricane drought”. The last major hurricane (Category 3 or greater) to make a landfall on the USA was hurricane Wilma on October 24th, 2005. That’s over seven years since a major hurricane has hit the USA. Sandy wasn’t even a hurricane when it made landfall, as it had been downgraded to an extratropical cyclone by the National Hurricane Center. The science and the numbers don’t support Mr. Gore’s assertions yet he presses on with his inflated issue, completely sure that weather events and climate are inextricably connected. Mr. Gore is no stranger to inflating issues like this as his movie An Inconvenient Truth has been demonstrated to contain many such inflated issues, with a judge in England ruling in 2007 that the film contained at least nine factual errors, making it unsuitable for showing in public schools there. So given that history, the latest revelation about Mr. Gore’s Climate Reality Project isn’t much of a surprise. That 16 million figure is the views counter for the channel at USTREAM. Mr. Gore and his supporters have claimed these millions of visits represent a success for the broadcast. But, like with Mr. Gore’s other claims, it folds easily with the slightest scrutiny. The data gathered from the broadcast doesn’t support the 16 million viewer total. As analyzed by a telecommunications expert it suggests the final number might be inflated, especially since the Gore team apparently had the “current viewers” count removed from the USTREAM video player, leaving only the total views count. If you look at any other USTREAM live feed, you’ll see two sets of numbers, representing current and total viewers. The current viewers count on Mr. Gore’s channel remained in the 10,000-12,000 range during the part of his broadcast where that number was available. The question is, why would they need to remove the “current viewers” counter mid broadcast? A second independent analysis of the data suggests that some electronic virtual viewers were involved, concluding from a mathematical analysis of the numbers that “At least 85% of total views were bots cycling every 10 seconds.”. And there’s more, the Internet traffic reporting website Alexa has monitored USTREAM since its inception, logging the visits. 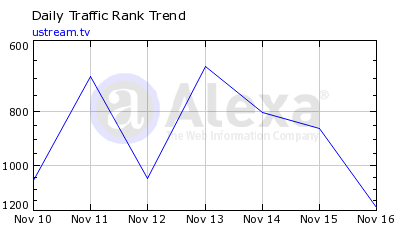 Surprisingly, there’s no traffic blip visible on Alexa from Mr. Gore’s event on November 14-15. 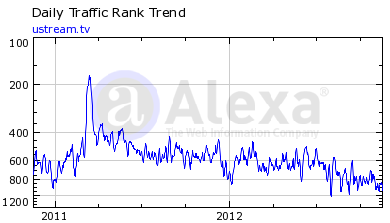 Traffic rank actually went down during that 24 hour period. On just the day of the quake Ustream hit 7.2 million views due to all of us who were glued to the stunning and terrifying imagery on the streams, an audience greater than Sheen’s antics and greater than those who watched the Chilean miner rescue. So with a claimed 16 million views for his latest global telecast, why doesn’t Mr. Gore’s “dirty weather report” show up as an even bigger traffic spike on the far right or in the magnified graph above? For that matter, where’s the traffic spike from September 15th of last year on USTREAM where Mr. Gore claimed 8.6 million views? It should be there and be even bigger than USTREAM’s best day ever of 7.2 million views, shouldn’t it? Readers may recall our own “Charles the Moderator” did a takedown of Gore’s USTREAM numbers last year. And, if USTREAM had a new record day with 16 million views, more than doubling their previous record traffic day of March 11, 2011, don’t you think they would be saying something about it? So far, not a peep. I suppose it is a matter of whose “reality” you believe, but it seems clear to me that the numbers outside of Mr. Gore’s reality don’t even remotely support his version of it. Readers may recall that Mr. Gore is no stranger to manufacturing his own version of science reality, and sadly it seems his viewership claims are as inflated as his ‘science’. ← A Climategate milestone – will 'FOIA' make the leap? I would really be interested in seeing the unique viewer counts. That will tell a tale of its own. Looks as if my guess of 15,000 human viewers for Gore’s lieathon was too high. The 10,000 to 20,000 should be a really good estimate. Over 24 hours there could certainly be millions of viewers (though unlikely), but that puts up the question how many of them were returning viewers anyway. I’m 100% that there weren’t all new IPs connecting and that most were returning viewers. That’s how streaming goes. I’ve been involved with Clint Hackleman from Myndflame, who broadcasts his entertainment every day, so I know one or two things about streaming and everything I’ve learned from Clint tells me that Crazy Old Al is pulling off some hyperinflation with this. Cool, Gore invented his own fan club where he is chief cook and bottle washer! Another Josh cartoon in the making! My mother taught me not to make fun of the disabled, so I have nothing to say. Jeesh – I’d like to see the ‘explanation’ from the warmists! but I will never give any traffic to those morons at RC, etc. The complicit lying just gets worse and worse. have they absolutely no shame? My guess is they are counting the indivudual neurons on each of his viewers. Can anyone spot the solar panels and wind turbines in Gore’s new home with 6 fireplaces? Like the inflated Al Gore he just can’t help hyper inflating global warming. There’s a Mother Nature News blog post on the topic that has to be the stupidest ever written. “Effected” or “Affected” ? Is his English as bad as his science, or did her really mean to say that? There’s a big difference in the magnitude of the lie. …and no…. you can’t see the data or the methods used, you’ll just try and prove them wrong…. This is a very serious allegation, and I hope that Time Magazine will give at least one of these scientists an opportunity to respond. I am concerned that the correct science is not coming over in the media and that the public is being lied to, to protect certain beliefs and interests. First, can I just explain that Sandy was not due to or caused by “global warming”. In fact, it is quite the opposite. Remember from your schooldays that (more) clouds and (more) condensation are formed when water vapour cools(more)? It is the global cooling that is now causing some extra weather events. 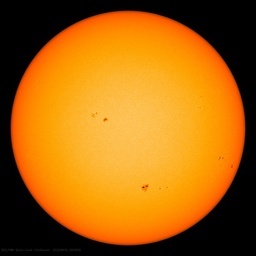 You will see this soon also being confirmed by much harsher winters. 2nd, can I just point out that it has not been warming for about 16 years. By 1950 all the molten arctic ice as reported in 1923 was frozen up again. My results show that in 2 or 3 decades from now, the lost ice on the arctic will also all be back. Recent reports show that the Antarctic has already gained more ice. The above graph clearly shows that global cooling has now started and will accelerate significantly. Lastly, I want to warn Time and its readers in the USA that they’d better be prepared. New York: take some lessons from The Netherlands on how to stop flooding. What would the advertisers think of this especially of they are being charged according to viewer count. He passes from the implausible to the irrelevant. Manufactured numbers, smoke and mirrors – it’s the usual line-up – self-promotion, dressed up as politics masquerading as altruism. Do not point, nor stare: Un-common; hardly rare. I smell advertiser fraud – they are bilking the Ad people at the higher rate. No wonder he can afford a new multi-million dollar dirty house on the beach. Isn’t Al on Apple’s Board of Directors? The math is probably not this simple but it seems like with even 10-20,000 viewers the average view time is less than 1-2 minutes. Largest storm on a planet in the solar system is on cold Jupiter. And Jupiter has little to no CO2. The strongest winds are on even colder Saturn. So the “warmth causes larger stronger storms” idea is not held up by the rest of the solar system. Interesting that my “generous” estimate from last year is just a bit higher than the current viewers number cited here. If the “time on site” numbers were similar this year to last, then the number of serious or dedicated viewers may have been as low as 1 to 2 thousand. 16m would be an even greater exageration. Even if you added Al’s neurons you still don’t get to one. Doesn’t matter if the number is phoney – allgore got the 16M screenshot he wanted. He will show it to his supporters and the MSM, and they will swallow it. Nothing else will be done about it, at least not where the general public will ever hear about it. It’s like the 97% figure for climate scientists supporting AGW theory. That has been debunked here and elsewhere in the sceptic blogosphere, but it keeps getting airplay, and most people probably believe it. I’m not saying to stop exposing algore et al, I’m just depressed about the success the hoax machine produces. Everyone who clicked on Ustream.com was automatically fed the Gore thing. There is currently the question of how is it possible that you can rack up 16 million total views and not have the Alexa traffic count support it? I can see one possibility: You are serving the stream from a server farm (you must). If the viewers (like a bot) are running on the SAME FARM, then IP traffic runs within the farm and the Alexa meters never see it. — Just one of many possibilities (I’m sure /sarc). Lots of whining here, as usual. Carry on. Gore’s the kind of guy that parks in a disabled parking space, jumps out, runs into the store, and leaves the strong impression that he isn’t physically handicapped at all. Actually, all I see here is a bunch of gloating, Jake. Except for your comment, which qualifies as whining. And our gloating isn’t derisive, either–it’s the satisfied knowledge that our adversary is passing himself off as something he isn’t (see my post above). I presume that many of the viewers for both the climate reality 24hrs and the WUWT version would have jumped to USTREAM from the main web sites. Alexa puts The Climate Reality Project slightly ahead of WUWT for those days. However visits for WUWT were down because of light posting from Anthony. Once most of us tuned into USTREAM we watched for several sessions and probably didn’t go back to WUWT because we knew Anthony wasn’t there to post new stories. The impact of this year’s 24 hr Gorethon wasn’t anywhere as big as last year. Al and his buddies may like to think that their dirty tv was a success but the computer says “no”. Al can’t find his missing viewers and it’s a travesty that he can’t! I don’t know how to do it but it would be interesting to see the charts comparing the Gorgon’s numbers and WUWT-TV’s based on IP addresses. So if Mr Gore firmly maintains a link between weather and dirty energy, then will he stop believing in global warming with every record snow storm? Spot the onvious spelling mistake and factual error all in one. bring on the IP data for gore’s “Viewer Reality Project” & WUWT-TV. “24 hours of Viewer Reality” might be a good name for the next thread, anthony. for the record, as someone who watched WUWT-TV in its entirety, i only re-booted once, as i was having serious problems trying to type in the comments box at WUWT to document screechingly loud “doctored ads” which were interrupting pesentations at crucial moments, e.g. at the very moment David Evans reached his HotSpot graphic. the fact marc morano’s presentation was bombarded with screeching “doctored” ads (in my feed at least) and maurizio morabito’s presentation came a close second for ad interruptions, makes me wonder if there was some “political” interference involved in the ad count as well. And “for the record”, early on in the broadcast I’d made a comment saying I was willing to leave my computer on even though Bob Tisdale’s presentation was breaking up on me if it would help somehow to defray the cost via the Ads. I wasn’t thinking of inflating numbers. After a half hour so I thought better of it. It didn’t seem honest to me and Anthony strikes me as one who, unlike Algore, would prefer his “filthy lucre” to be clean. Is your statement of millions (16) of views for your 24 hrs of ‘Dirty Weather’ in the same category of truth as your statement of ‘millions of degrees’ as the Earth’s core temperature? Looks like your truth skills have not improved since divinity school. Let’s face it. Al Gore has become irrelevant except for a few thousand disciples and syncophants. This is a good thing and stories like this just expose his fall for all the world to see. Great job as always! You may be right – but trying to back up anything with Alexa numbers is like saying you heard it from the Easter Bunny. So again, you may be right. But if you’re going to critique numbers with other numbers – you find something that is reliable and not complete conjecture so that our own credibility isn’t lost. What’s a few zeros between friends. In some accounting circles, M = 1,000s. (16M = 16,000). Not saying that’s how it’s used here, but maybe they accidently got it right. You know what they say about stopped clocks. On November 14-15, millions around the world tuned in to 24 Hours of Reality: The Dirty Weather Report. Darn I missed the whole thing! – never mind, I guess I’ll have to resort to getting my science from scientists! Can you say “non sequitur”? It’s like saying, “dirty soil=dirty crops”. What do those numbers on the vertical axis of the viewership charts represent? Didn’t notice, but were there any ads running during CRP’s presentations? I know that WUWT had to accept ads to defray costs, but I can assume that CRP had a version that allowed them to run without ads. So there may not have been any commercial sponsors to question the numbers. If there were commercials running, then perhaps a letter to the PR section of that company would clear up the numbers problem. The UK court judgement on “An Inconvenient Truth” was actually a lot more spineless than that. The film was allowed to be shown in public schools, but had to be accompanied by notes pointing out the errors, which teachers were supposed to present as an accompaniment to screening the film. There are so many versions of “the…trick” I can’t keep them all straight anymore. Are we allowed to call people liars here? Because that would kind of answer the question as to what happened with the numbers. In the MSM I have seen not a beeping Beep reported of Al’s Goreathon. So even for them, Al Gore seems to be well past his half-life, already. Where’s the hockey stick when you need it.. This particular metric is also strange – for their 16M views, there were only 3,279 followers. Does this mean that there was a 4,879.53 views per follower ratio? Getting straight to the Organ Grinder: I have asked on the Upstream Community board. Apparently the Upstream Team do input to this. > What do those numbers on the vertical axis of the viewership charts represent? That’s the site’s ranking, or popularity. A rank of 1000 means it’s the 1000th most popular site for that measurement period. Small numbers good, big numbers bad. Interestingly, if you go here http://www.ustream.tv/new#/climatereality you will notice that the whole thing generated, from apparently double digit millions of viewers, JUST 1,700 Facebook “likes” and ONLY 1,160 Tweets. And a lot of those tweets were very obviously Gore Stooges saying how they would like to join up with the er, “Movement” [Reich]. Views of the isolated recorded hours are equally low, in low thousands at best, or even just in the hundreds. Something stinks… It’s tree rings all over again. And I see that Gore has annointed himself with a new title: “Join Nobel Laureate and former Vice President Al Gore in a star-studded final hour….” Note: This is hat a Nobel Laureate is: http://www.nobelprize.org/nobel_prizes/prize.html. Al Gore is not this. Strongest wind, second largest planet. Available energy to do work (make storms) is based on the ratio of the difference in temperature (absolute) between the hot side and the cold. If the cold is 10 Kelvins and the hot is 20 Kelvins, there’s a lot more energy available than if the cold is 290 and the hot is 300. The “effected” vs “affected” issue is important. The words mean different things. “Effected” means it is the result or consequence of an action i.e. Means all weather events are the result of or caused by global warming pollution. Today, it was raining where I live. That is a weather event and it was the result of “global warming pollution”!?? Nothing to do with it being a fairly typical November day in England?? recall someone commenting on one of the WUWT-TV threads that when u opened USTREAM u automatically got gore’s progam. whether or not it played automatically, as with youtubes, the person didn’t say. can’t locate the comment just now, tho may search again later. however, if it did play automatically for all visitors to USTREAM during the 24 hour period, that would all count as viewers. could this be a case of the USTREAM having gore’s program as a kind of default? there was definitely some DIRTY business going on. NOTE: This is a serious question not just a rant. Does anyone know the answer? Al Gore seems to be against power generation by oil, coal and gas because they produce carbon dioxide. He also says nuclear is likely to be too expensive and no doubt his green friends would be against it. Off-shore wind and tidal are only local. On-shore wind is too uncertain and damaging to the visual environment. Solar isn’t going to work in huge areas although it mighthelp house by house. Where is America going to get its electricity? Convert its grain into alcohol? Abandon the Northernm Central states to the winter? I noticed that too. The problem is, that count appears to be just for the 24th hour (the Al Gore show). If you dig in and get each individual hour, and total up those Facebook “likes” and Tweets, you only get less that 150 likes and less than 100 tweets. Some hours have “highlights”, with its “like and tweet” numbers, and it’s possible that different languages also generated their own numbers. Seems to me, someone might go through Facebook and Twitter to see what their traffic was for that time (number of tweets tied into #dirty weather). BTW, if you call up the separate Climate Reality: The Dirty Weather Report on USTREAM, they’re listing 16,862,859 views. Again, we should be seeing something somewhere that a new USTREAM record has been set. Still quiet. keep digging. and remember quite a few who clicked on to gore’s thing were WUWT sceptics taking a peek…tho not me. I think WUWT is being very unfair by pretending Gore is dishonestly claiming 16 million viewers when he was actually being entirely honest and admitting his programme was watched by 16 morons. Why cant we kill these snakes. The 9-headed hydra that keeps growing new heads. Whats the madness at the core of their global cancer. They are consuming the World and we cant stop them. They are inciting World wide madness which can only lead to one thing. World War and violence. Leaders who we thought were on the side of goodness and Freedom, are turning coat everyday. We need to identify the central demon, the cabal thats driving us to the brink. Wheres that team of heroes, come forth and save America and the World from fascism before its too late.